The Orchid Column: Weird is cool. Here is orchid weirdness at its best. Something that Morticia Addams might wear as a corsage. In a genus known for offensive morbid odors and peculiar twitching parts, Bulbophyllum medusae stands out for being...graceful. Not that it doesn't smell a bit funky--it does, as one might reasonably expect from a fly-pollinated Bulbophyllum. But the fragrance is pretty mild compared with the body-buried-under-the-stairs stench of Bulbophyllum carunculatum, or the road kill-with-bleu cheese bouquet of Bulbophyllum falcatum. No, Bulbophyllum medusae dances rather than twitches in the breeze, an invitation to pollinators to come hither. The flower spike is a many-flowered umbel, like a globe-shaped Queen Anne's Lace. Each creamy flower has long (up to 8 inches) graceful sepals. Any twitching that occurs goes on inside the flower, each of which has a hinged petal (lip) to throw the pollinator off balance and up against the pollen masses. 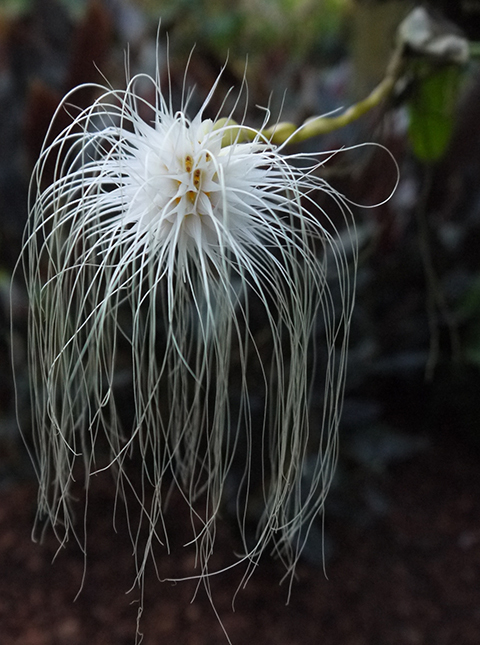 It seems entirely fitting that Bulbophyllum medusae flowers at Halloween. A terrific addition to our Medusa orchid collection. Wonderfully freaky and at the same time looks like an ultra-modern light fixture. Halloween is almost upon us. Is it blooming? It will flower off and on through October. Freaky indeed!